And you know why that is? It’s because our connection to the God of another chance is tight enough to not let us go. Our Father is strong enough to keep us even if it’s hanging over the cliff. Our God is mighty enough to hold us even if we happen to be in a jacked up place again. This is why you have to stay connected to the right source. And this is why you have to make sure your connection is strong enough to hold you through the difficult circumstances you’ll face in this life. This is why you can’t just put your hope in everything and anybody. See, had I had a cheap charger, my phone wouldn’t have stood a chance but because I invested in something stronger, it held on. So I ask you the question, who are you connected too? If you were to fall over the cliff, would you be in good hands to hold you? 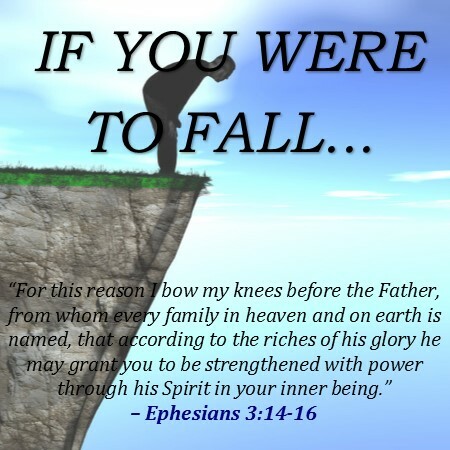 If you were to fall, again, is your faith connection to God strong enough to keep you? If you were to fall, would you survive? Or would you end up at the bottom, cracked up and unusable?